This 4-year-old Knows Nothing About Cancer. She Waits To Go Home. 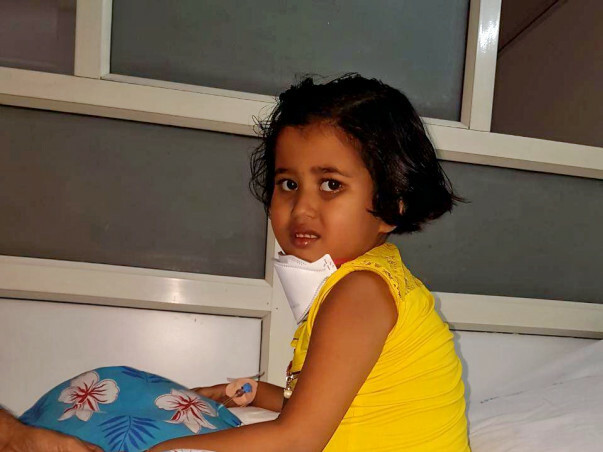 4-year-old Meghla asks her father everyday, “Baba, when will we go home?” The toddler has spent a whole month in the hospital now. The glum, slow life on the hospital bed is too much for the once-active little one. Her father Shyamlal is struggling to find the answer. A month in the hospital with no income has left him heartbroken as well. Meghla had slowly started turning blue in places. It was over a month ago that Meghla started complaining of a stomach pain. She would wake up suddenly at night and start crying out of pain. Slowly, she started developing blue spots on her body, that began to spread. Her stomach pain would not let her eat as well. Meghla’s parents were clueless, and decided to consult a doctor. Their healthy little toddler, who never made a fuss over food, was suddenly refusing to eat anything. At first the doctors detected a swelling in the liver. Meghla’s parents immediately brought her to Hyderabad. The first hospital detected a swelling in the liver which was causing the little one unbearable pain. When further tests were conducted, the family was sent to Yashoda Hospitals, where they could access better facilities for her treatment. 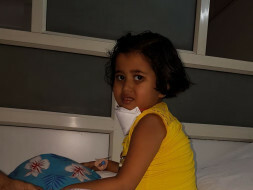 Meghla was diagnosed with Blood Cancer. Shyamlal’s journey to save his daughter’s life began before he could come to terms with the fact that his daughter had been diagnosed with a life-threatening disease. 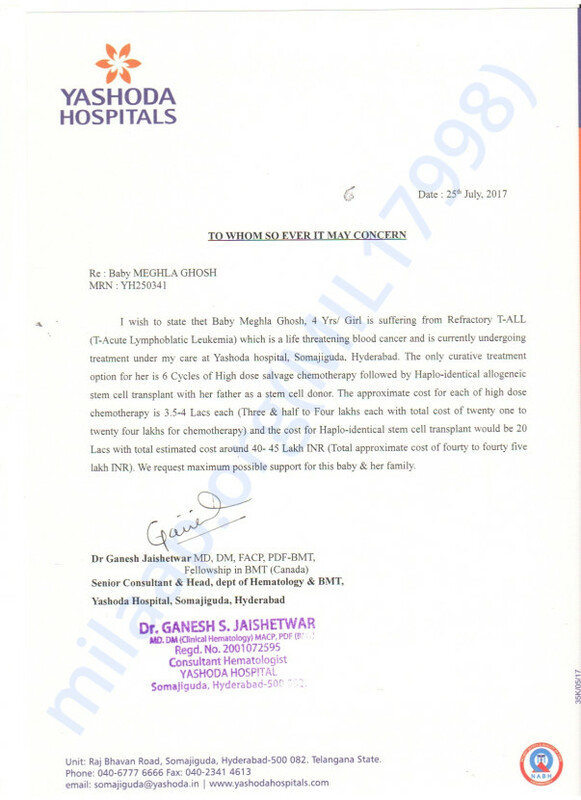 The 4-year-old is suffering from Refractory T-Acute Lymphoblastic Leukaemia (T-ALL), a type of blood cancer. Little Meghla can still be saved. She would need 6 cycles of high dose salvage Chemotherapy and a Bone Marrow Transplant at the earliest. With her condition worsening day by day, Shamlal is losing hope. The combined cost of the chemotherapy and transplant would be between 40 and 45 Lakh. This is the only way this toddler can live. Shyamlal works as a helper in a shop. He earns Rs. 8000 a month. Despite this income, he managed to arrange around 3-4 Lakh to keep the treatment going till now. Shyamlal’s helplessness is evident, but his toddler is unable to express her pain in words. She is bravely holding on to life, despite her body failing rapidly. Any contribution would add more days to this 4-year-old’s life. 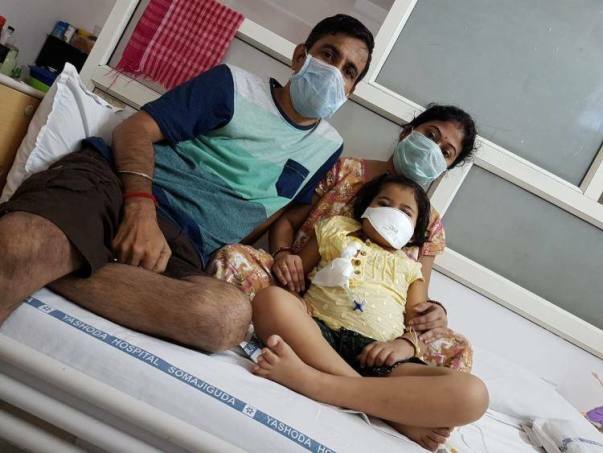 Shyamlal can save his daughter’s life with your help. Meghla passed away on Saturday (11th November). Our hearts go out to this brave child who endured so much pain and fought so hard for her life but due to the severity of her condition she was unable to make it. Your timely support ensured that she received the best medical care. 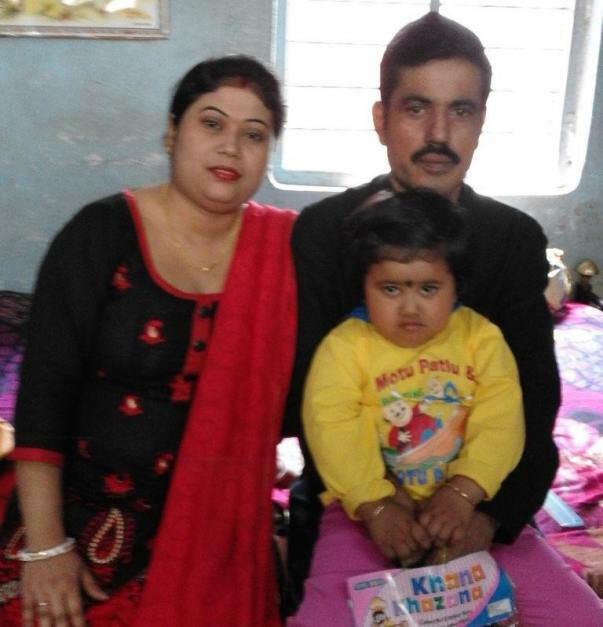 Funds from the campaign will be utilized for bills incurred by the family for Meghla's treatment. The family is grateful for all the care and support you’ve shown Meghla. The past few days have been the most difficult ones for the family. We hope they find strength in this time of grief. May Meghla's soul find peace. Please keep the family in your prayers. Here is an update on Meghla. She is doing well and as per the doctors, her response to the treatment has also been good. Out of the initially prescribed six cycles of chemotherapy, 2 have been administered. After the fourth cycle of chemotherapy has been administered the doctors can confirm whether the dosage of chemotherapy will increase or a bone marrow transplant has to be performed. She has mild side effects, like body pain, nausea etc. A few tests were performed recently and all the reports are normal. Her blood count is almost stable with mild fluctuations. We are very grateful for all the love and support you have shown Meghla. I just cannot thank all of you enough for supporting us and bestowing the strength upon us in this difficult time. Here is an update on Meghla's health. Meghla will be visiting the hospital tomorrow for couple of tests post which her second cycle of chemotherapy will start. She is currently at home. Her father has informed us that she does not eat much and some times she gets upset. However, he did mention that there is improvement in her health. He is hopeful that the chemotherapy will improve her health and she will get well soon. It has been a difficult time for the family and your support has helped them immensely. The family is grateful for all the love and support you all have shown towards their little girl.